After 5 days at the grindstone looking at the sunny weather outside I finally had a day off and the weather was crap again. Grey, misty, drizzly. 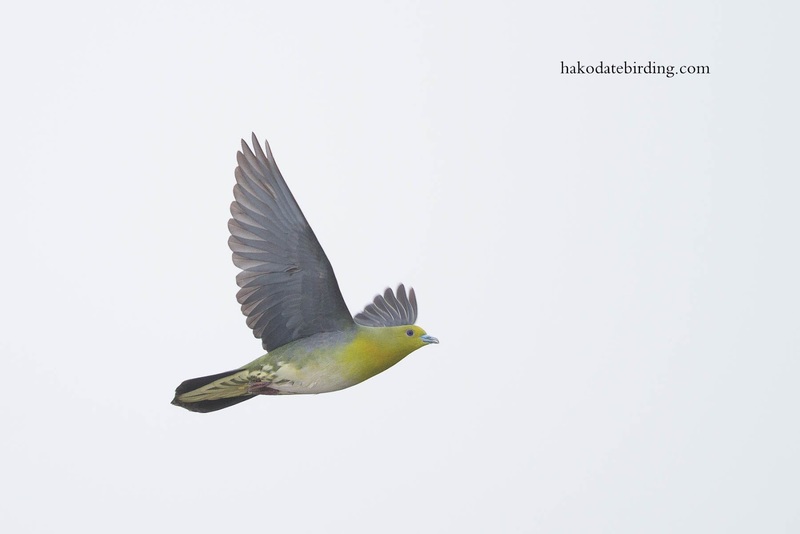 The above Japanese Green Pigeon was at its usual place near Shikabe, the flock was very skittish though and after an hour I gave up. A bit bored at the moment.................summer is my least favourite season (even when England aren't being crap at major football tournaments) and we're now entering 6 or 7 weeks of mostly downtime. I was so bored I watched 'Pompeii' last night..............what a silly little movie that was. Actually judging by its shape and the large rocks scattered everywhere the volcano at Onuma must have had a huge eruption in historical times, wonder if there are any ash entombed Green Pigeons anywhere? You do sound fed up. That's what you get for watching footie. Otters are everywhere now including Preston and the Fylde. Hello Stuart! :) I'm back blogging now, and trying to get around to see my favourite blogs. Always a pleasure to visit yours.I have never heard of the Japanese Green Pigeon,... a pretty bird, and nice capture. Perhaps you should be watching "Up Pompeii" instead ? Funnily enough many Japanese men in their 60's look uncannily like Frankie Howard. Seriously.